So they're cute, right?! They're called Munchlers and you can get them here. They're really cheap at only 10 bucks for an insulated lunchbag. The part I love most (after the cuteness, of course), is that they flatten out and can act as your plate, too. 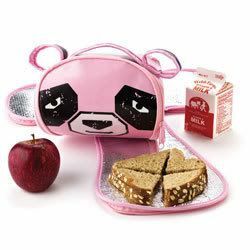 Adorable for kids, awesome for quirky people who like to have a little fun with their lunch instead of brown-baggin' it! There's also a tiger and a dog not posted, so check those out if the sad panda and bunny don't suit your tastes. Let me know if you get one or have something similar...I'll post about you, too! Hehe. "Can I have a REAL kitty, Mom, please?" Don't you wish you had kids? I think these are cute and practical. I am going to see if my nieces might like these for school. I think that these might be cute for my son. He'll be in Kindergarten in August. 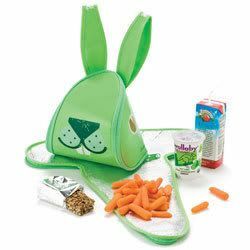 Those are pretty cool, but they aren't as cool as my reusable bag substitute: My kangaroo's pouch... I wish her baby would stop eating my Cheetos... Do they make a kangaroo model? Whoops, my reply for this never went through! And I do think they're perfect for kids! I mean, come on, these certainly beat out those plain square plastic boxes with cartoon pictures on them or even worse, the plain bags you'd expect your parents to take into work. Those just aren't cool, but these bad boys are. I love 'em! Hehe.